I wish you could feel how soft my hair is as I type this. The Nioxin Thinning Hair System 7 Kit has quite literally changed my life. Now, people wouldn't normally know this when they look at my hair, because I blowdry and flat iron it to within an inch of its life. But my hair is THICK and COARSE. (I typed these words in all caps for extra emphasis on this point.) Without at least two conditioners (a rinse out and a leave in), I can't even get my fingers through my tresses -- they just get stuck near the roots! But thanks to this incredible 3-piece hair system, my strands are singing a different tune. These three products are specifically formulated with SmoothPlex, a patented blend of silk amino acids and kukui nut oil for moisture, shine and control; Glyco-Color Shield, which safeguards the scalp against chemical services and preserves hair color; and the Transactive Delivery System, a time-released delivery system that provides antioxidants to the hair and scalp and creates an environment for healthy, full hair. Thanks to this amazing system, my tresses are healthy, nourished and SHINY. No coarseness or dryness in sight! The NIOXIN Thinning Hair System 7 Kit retails for $39.99 and is available exclusively in salons and spas nationwide. 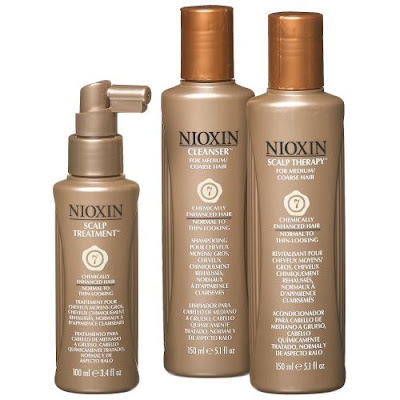 For more information or to locate the nearest NIOXIN salon, call 1-800-628-9890 or visit nioxin.com. This post was sponsored by NIOXIN. Products were provided for review.